The growing area in Germany with a vineyard of 15,836 hectares is the third largest and the southernmost. It extends over 300 kilometers from Lake Constance along the Upper Rhine Plain via the Badische Bergstraße and the Kraichgau to Tauberfranken. More than three quarters of the total vineyard area is out of the approximately 100 Winzergenossenschaften processed. These make use of the huge central winery founded in 1952 Baden wine cellar, which is one of the largest European cooperative farms. The large area is distinguished in South Baden and North Baden. 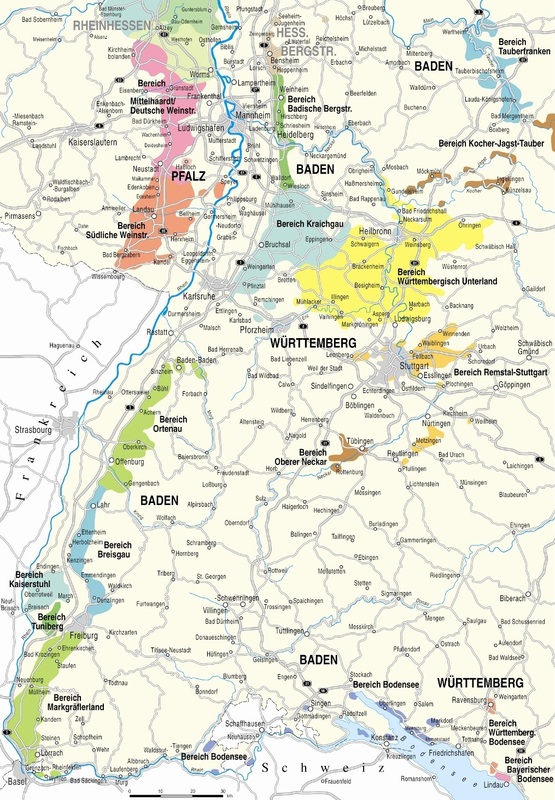 Because of the above - average warm climate Baden is the only German cultivation area, which belongs to the Wine growing zone B and thus to the same zone as the French regions Alsace. Savoy and Loire, and also Austria belongs. To the north lies the city Heidelberg with the already founded in 1386 the latest German university. The Badische Weinstraße starts north of this city and leads to Ortenau in Südbaden.